Last week, I blogged about the Engagement Photographs I shot for one of the loveliest couples I've had the pleasure to work with, Lina and James. Please join me in wishing them a Happy Anniversary today! These two lovebirds were hitched in a civil ceremony and the day after, they had their reception. 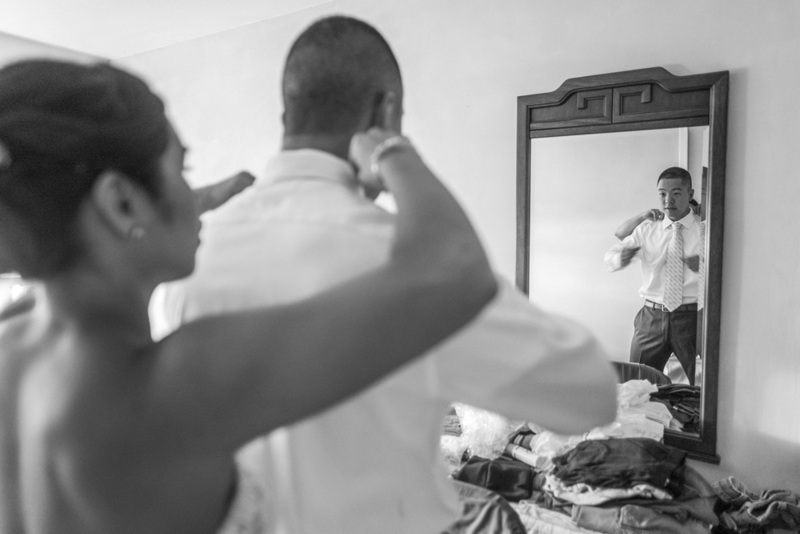 The couple and families got ready together at Lina's parent's apartment in Manhattan's Lower East Side. Lina's mom, Nui, and sister, Mei, had their hair and make-up done and took turns applying the finishing touches to the table settings for the reception. Lina's father, Gary, made tea for everyone in the kitchen just before Nui propped up her ironing board between the sink and stove. The gifts for the wedding guests were packed up. After Mei had borrowed a few pieces of jewelry from her mom, we were ready to hop in the car and head to Chinatown. We arrived at the Golden Unicorn; a special venue for Lina because her parents brought her and Mei there often when they were children. As soon as we arrived, Lina's cousin, Kara started to help set everything up. Guests slowly trickled in and said hello to the happy couple. Before the Dim Sum dinner was served, the Wan Chi Ming Hung Gar Institute presented a Dragon Dance. The gong rang and the dragons entered the room! They danced for Lina and James, who in turn "fed the dragons" cabbage as glitter was tossed onto the floor in celebration. A red circle was presented and placed around the couple thus, tying Lina and James' hearts together. From there, the couple took their first dance and enjoyed the meal! Speeches by the Best Man and Maid of Honor were made and afterward, the DJ started up the dance party! Lina and Mei slipped away for a moment, and the bride returned in her red Chinese Wedding Dress. Towards the end of the night, Lina had one final "outfit change" and put on her mother's Chinese Wedding Dress, a gorgeous shade of orange that boasted a hand beaded Phoenix Bird.